The race bibs that jumpstarted by running career. Missing was my Sugar Rush Fun Run bib to complete all sixteen! I ran 16 races in 2010. That’s 78 kilometers in total. Running wasn’t in my fitness blueprint last year but I found myself joining each month because my friends were doing it, too. This is one of those things where blindly going with what’s in and hip paid off well for me. In the average, my race time was around 43-52 minutes, staying closer to 46 minutes for most of the races. It took us a long time in CamSur – that’s where I hit almost 52 – because of the number of runners who joined. It became very hard to get through throngs of people so we just enjoyed the slow run. It was still fun. Overall, I consider my race time a respectable one for someone who has not had any training nor experience in running races before I made my first stride in February. It was a year of flexing my muscles and of experiences. I learned how to carbo-load (overdoing it most of the time, hahaha!). We also met new people, both in races itself and during our Adination training runs in Ayala Triangle Park. There were also lots of freebies – the most bongga of all was Robinson’s Buddy Run; my lootbag was literally stuffed with groceries which was so worth it for its 350-peso registration fee. Speaking of fees, that’s my only minor complaint about this running hobby. It’s a business already. Registration fees range now from 500 and above, increasing as you aim to run longer distances. Lucky for races with lots of freebies, but for those with almost none, you only took home a singlet. Parang nagbayad ka para mapagod. But overall, my experiences were worth it. It’s hard to mount a successful marathon without money to get you by. When I look back, I am happy that running has strengthened my stamina. I still got sick but in the overall, I feel more flexible now. I may still be slow for a 5k runner but that’s a very huge improvement from feeling like almost dying after running the two-kilometer distance from my office to CCP before I dabbled into this. Now I can finish 5k, albeit a little tired and so sweaty, but after I slowed down, I am doing okay again. After 16 races, I felt the need to level up. 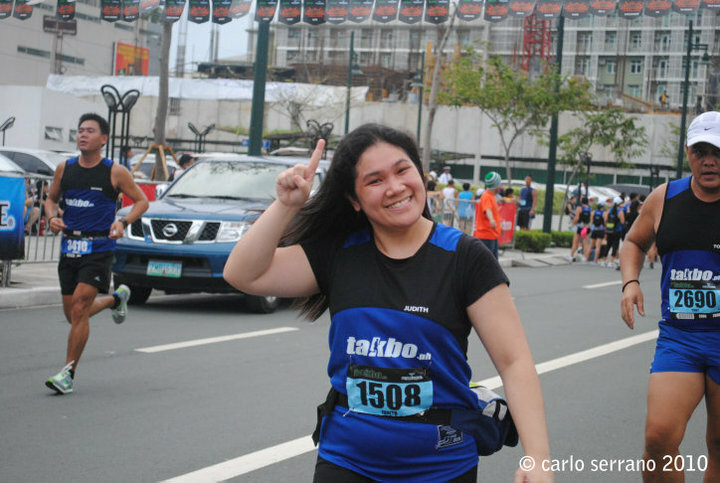 This coming February 6, I will be running my first 10-kilometer marathon at the Condura Skyway Marathon! From today until the race, I need to train for a distance that’s twice of what I used to run. It’s not going to be easy but I figured, I need to start sometime, for I can’t stay in 5k for another year. I am giving myself 2 hours at the most to finish 10k. If I finish it way earlier than that, I will be very happy. I will keep you posted of my first 10k experience. Did you run in any 2010 marathon, too? How was it? If you haven’t tried, I urge you to give it a shot. It’s fun and healthy at the same time. Here’s to running in 2011 and beyond! too bad 1 lang na join ko yun Century Tuna. Goodness. My 2 attempts ako pero d natuloy that is un sa Pink Run and Mcdo run. girl, never too late to try again! 🙂 hope to see you in future marathons. ang laki ng pinayat mo dyan, ha! tumakbo ka na, daig ka na ni gombie!